Search Engine Marketing (SEM) techniques is a quick and effective method of driving qualified visitors/traffic to your site and boost your ROI. 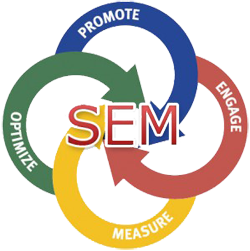 SEM or Search Engine Marketing includes search engine optimization, web marketing and online media buying. Basically, it includes any form of advertising that is designed for maximum search engine visibility. SEM allows you to bid on keywords based on your business, product or website. Quad SoftTech is proficient in each of the SEM areas and the best ways to incorporate client aims. We dedicate the time to collaborate on important decisions and establish an ongoing communication structure that allows for efficient management of campaigns. Process followed at Quad SoftTech for running effective SEM campaigns with vendors like Google AdWords, Yahoo! Search Marketing and Microsoft adCenter. We plan which keywords and phrases to be targeted for getting desired results. SEM campaigns may involve hundreds or even thousands of keywords. We select which search engines will best meet your objectives. Determining opening bids for each keyword. Creating eye-catching & high converting ad copy to use for each listing that results in a high rate of conversion. Creation of Landing Pages to help measure results and increase ROI. Search Engine Marketing (SEM) is not only cost effective when compared to both online and offline channels but it’s also the fastest growing and popular channels available. There are lots of benefits of SEM, but the main advantage of SEM is it helps your business to increase quality traffic to your site and increase the conversion rate of visitors to buyers.